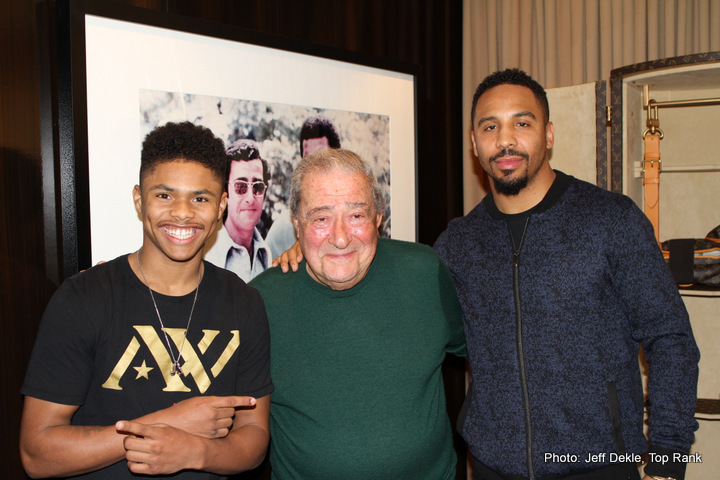 Top Rank® and Antonio Leonard Productions announced its latest signing and it’s a sterling one — 2016 U.S. Olympic silver medalist SHAKUR STEVENSON. Stevenson, 19, from Newark, NJ, sailed though every stage of his Olympic competition in Rio De Janeiro last summer before losing a close split decision in the bantamweight championship fight to 2012 flyweight Olympic gold medalist Robeisy Ramirez of Cuba. Ramirez swept the judges’ scorecards in round one with Stevenson returning the favor in round two. In the third and final round, the closest of the three rounds, two of the three judges gave the round to Ramirez and the gold medal, by the slimmest of margins. It was the best finish for an American male boxer since Andre Ward captured the gold medal in the Athens Games of 2004. Ward is now part of Stevenson’s management team along with James Prince and attorney Josh Dubin. The only boxer to make Forbes “30 Under 30” in its Sports category, Stevenson was selected by a panel of judges comprised of James Harden, shooting guard for the Houston Rockets, Phil Knight, Chairman Emeritus of Nike and Casey Wasserman, Chairman and CEO of the Wasserman Group. Stevenson will make his pro debut as a featherweight . The date and site of his pro debut will be announced at a later time.